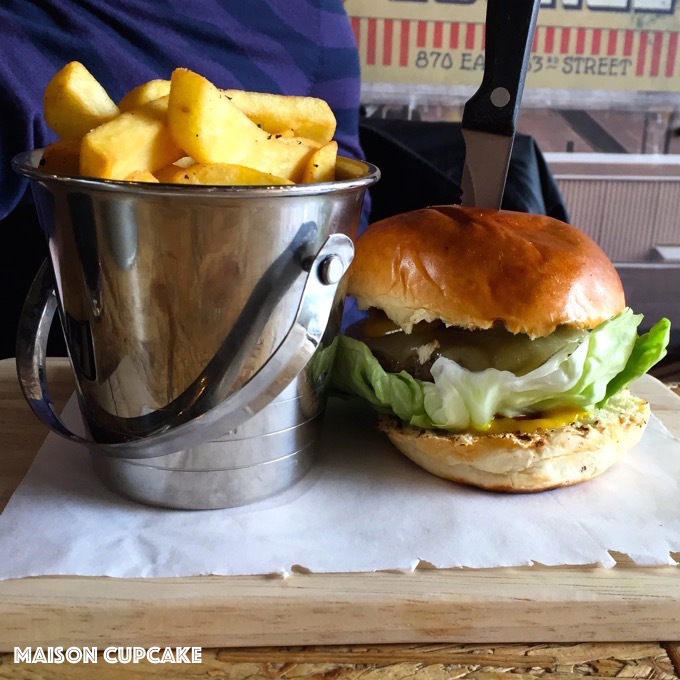 There are now several burger restaurants in Walthamstow, Leyton and North East London. 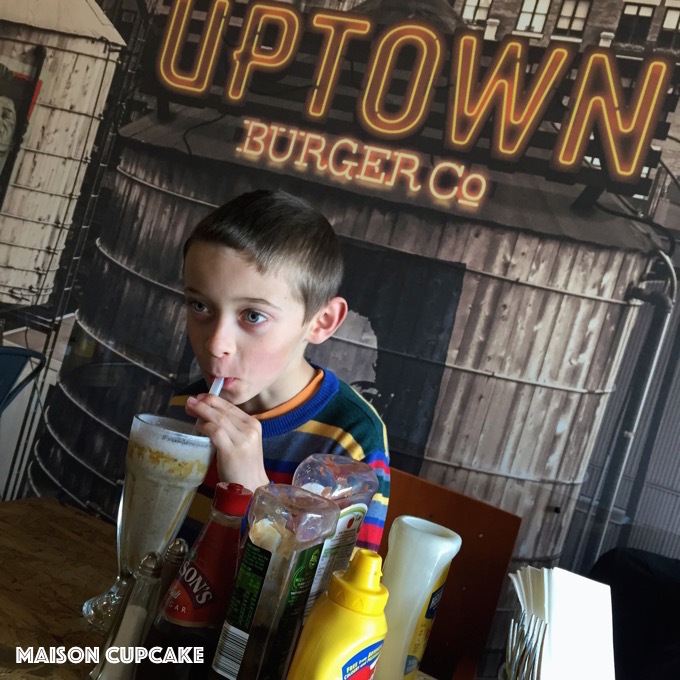 Last week we visited Uptown Burger Co on Leyton High Road. There were slim pickings of restaurants in Leyton and Walthamstow when I moved here from Shepherds Bush over ten years ago. Post Olympics, Waltham Forest feels less of an opposite to West London and more its equal in terms of places to go out, eat and be entertained. Leyton High Road is over a mile and a half long and Uptown Burger Co sits equidistant from Leyton tube station on the Central line and Bakers’ Arms shopping district on Lea Bridge Road. The cricket ground across the road gives a village feel and the nearest railway station is Leyton Midland Road on the Overground, around 5 minutes’ walk away. On the edge of the flourishing Francis Road neighbourhood, Uptown Burger Co is one of several new intriguing Leyton destinations that have popped up since 2012. A friend rented a house here in 2002 and after she babysat my cat for six weeks (long story) our own property search focussed here too. Back then Leyton still felt scruffy and devoid of much to do and so we opted to relocate up the road in Walthamstow. East London has changed a huge amount in that time. There’s always something new to investigate and our weekends are often spent trekking everywhere from Hoxton to Hackney and Clapton to Chingford. Last Saturday our route took us from Walthamstow Village to Francis Road, along Leyton High Road and back up Grove Green Road towards Leytonstone. This was our lunch break at Uptown Burger Co, a diner style burger restaurant that serving burgers with patties made from halal beef and chicken. Ted had an Oreo milkshake which was as good as any served in Gourmet Burger Kitchen. Served in a traditional sundae glass with a drizzle of syrup around the edge. My husband and I ordered fizzy drinks (Diet Coke and Sprite) which were served in old fashioned half pint chunky pub beer glasses with handles. This amused us greatly since you don’t see these glasses that often now and Uptown Burger Co doesn’t serve alcohol. So the knives speared through them are a bit scary. Personally I’m a bit icky about wooden skewers being left in my burgers so a whacking great steak knife is freaking me out slightly. My “Mexican” burger complete with tortilla chips and salsa was indecently drippy causing a river of liquid on our chipboard table that took several paper napkins to mop up. Although neither my son or husband had this problem so maybe I was unlucky. I like some juiciness to leak out of my burger but this was a bit crazy. The bun is glossy like brioche but normal bread not brioche. The burger itself was large with chunky meat and cooked medium just as we’d asked. Burgers on their own are priced around £6-8 however two of us were taking advantage of the very generous lunch deal which offers a classic beef or chicken burger with chips and a drink for the insanely good value of six pounds. So it feels churlish to say this wasn’t my favourite burger ever but at this price it was flipping marvellous. I would say the chips are most likely bought in frozen rather than hand cut on the premises. You get a generous amount of them ready sprinkled with black pepper in a stainless steel bucket. Sides of olives, chicken wings and salads are offered. We didn’t take these as clearly we had enough on our plates (or boards should I say). Uptown Burger Co was extremely quiet i.e. empty when we arrived at around 12.30 on a Saturday although some more people came in when we left. It’s not the best location for casual passers by and maybe suffers from being beyond the main drag of shops in either direction. 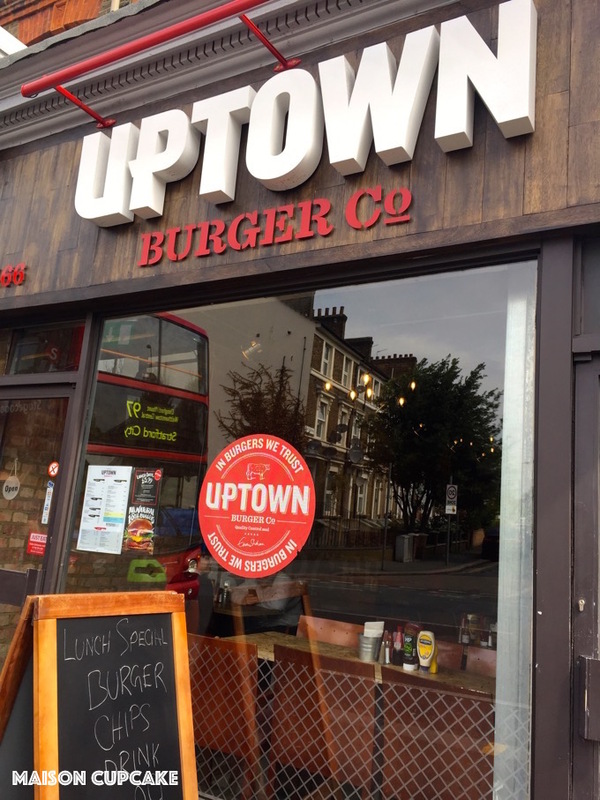 But Uptown Burger Co is a quirky addition to Leyton High Road and I hope they get enough trade to succeed. Food – considering the price of a lunchtime meal deal at £6 including burger, drink and chips, this is phenomenally good value. It’s not the greatest burger I ever had but they had a damn good go and I cannot argue with this for £6. I don’t know how the chicken burgers compare. Ambiance – We love the vintage Americana cityscape mural. 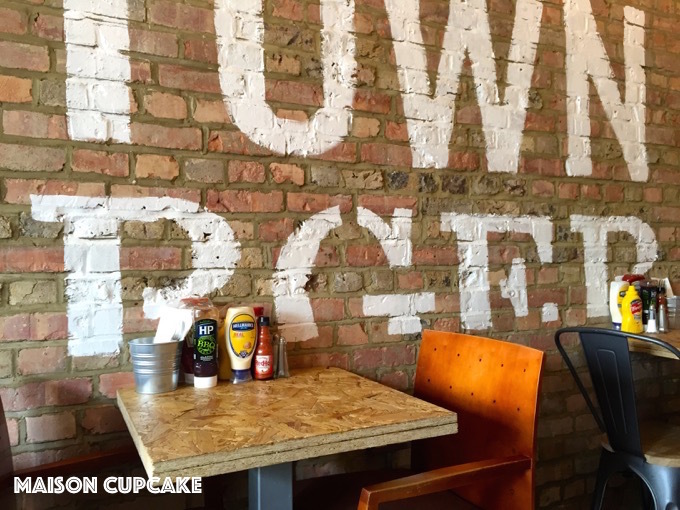 Uptown Burger Co has a great interior – that probably didn’t cost much to achieve. Service – friendly and efficient. Loo – there’s one out back and it’s fine but was extremely chilly in there on May Day weekend. Would we recommend? Definitely for lunch, yes. Would we go again? If we’re passing by and we’re hungry, absolutely. But there are a fair few options springing up near by to choose from too. Kid friendly? No kids menu but our 7 year old wolfed three quarters of his grown up size burger. For that reason I’d say it’s best for junior school aged children upwards. For teens it would be perfect. 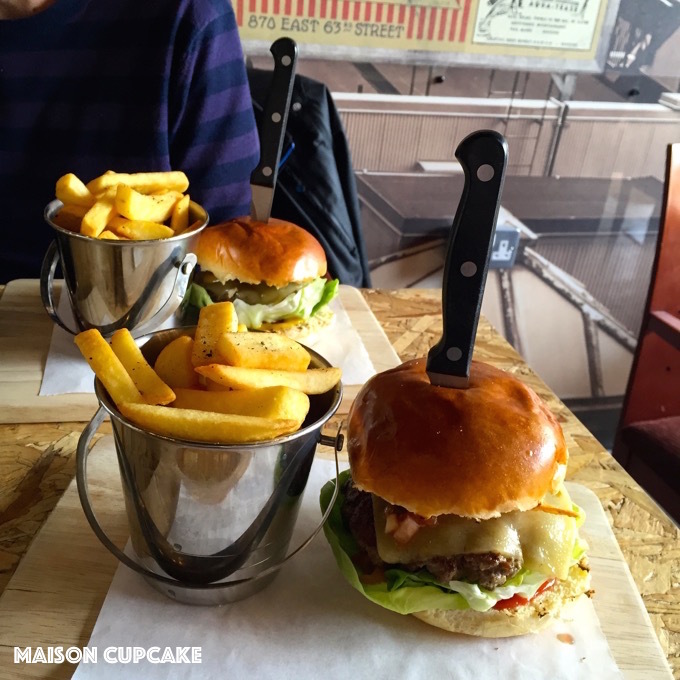 Can you recommend anywhere else to eat burgers in and around Walthamstow? If I’ve missed your favourite burgers in Waltham Forest or you’d like to comment on your local burger experiences feel free to share your thoughts below and I will add to this list if I experience any new ones myself! That sounds like really good value for a burger place. Burger restaurants are huge in Manchester, but they are all quite expensive. Sounds like a good price and the burgers look pretty good too. The knife spearing the burger does look a bit OTT though. I know, it’s like something out of Psycho. Oh yes that does look like a nice lunch option. We have no burger places at all in my neighbourhood though we have some nice Vietnamese, Japanese and pizza places at least. You might get one soon. I would love a Vietnamese place to open in Walthamstow, so far as I know we have to go to Dalston or Hackney from here. Your local Uptown burger joint would do so well in Epsom. I am earthier envious of all the lovely places you can go and eat. We are so far behind but I hope things are changing. It also sounds like great value which is always a key factor! I think independent burger places in the manner of a Gourmet Burger Kitchen are a growing trend. We have another independent burger place (the Proper Burgers one) which I need to try as well. I’m also noticing independent versions of Nandos doing piri piri chicken are popping up everywhere too. I would eat burgers in any place that serves an Oreo milkshake. I am pretty envious you have so many great places to eat around you Sarah. We do have lots of choice around here. And of course central London is only a tube ride away. Ah yes but you have fresh air! Sounds like a great lunch option , I am lucky to be within walking distance of a fabulous high street with many places but I love GBK the most and oh yes some really great Japanese and Korean places! I would love a Korean place to open in Waltham Forest. I’d be straight in there!